Thank you to all our nurses! To mark Nursing Week, we are presenting a mini-profile of just one of the members of the MCH nursing staff. Although Jing Xin Sun officially joined the MCH family three years ago working first as a PCA, and now as a nurse for the past year; he knew he wanted to work at the hospital long before he applied to nursing school. A former patient and student volunteer, the South Shore resident says his decision to pursue a career in healthcare was greatly influenced by a neighbour who worked as a nurse and often shared stories about working in a hospital setting and delivering patient care. 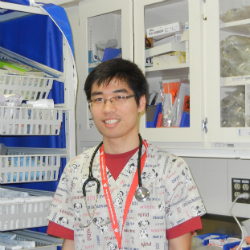 As a nurse on 6C, Jing Xin says he enjoys working with patients and their families, and likes to think that being a guy helps him bring a fresh perspective to the table. “I think my patients enjoy the different dynamic,” he says. When asked about what it’s like to be surrounded by females, Jing Xin says he feels grateful to be a part of such a great team of employees. “Working predominantly with females wasn’t that big of an adjustment for me because it was similar to the environment in nursing school,” he laughs, adding that he feels fortunate to be working at The Children’s, where there is a higher proportion of male to female nurses in comparison to most hospitals.